With the changing of seasons and the valley succumbing to the arrival of Autumn in all it’s glory this pomegranate tree in it’s raw beauty has been catching my eye every time we drive past it (and ok I admit it I might be just a little bit obsessed with pomegranates!). Finally the other day we were driving past with the right light so I got Atef to stop, jumped over the stone wall and tried to get some photos on my phone which did justice to how beautiful this tree and it’s surrounds are. 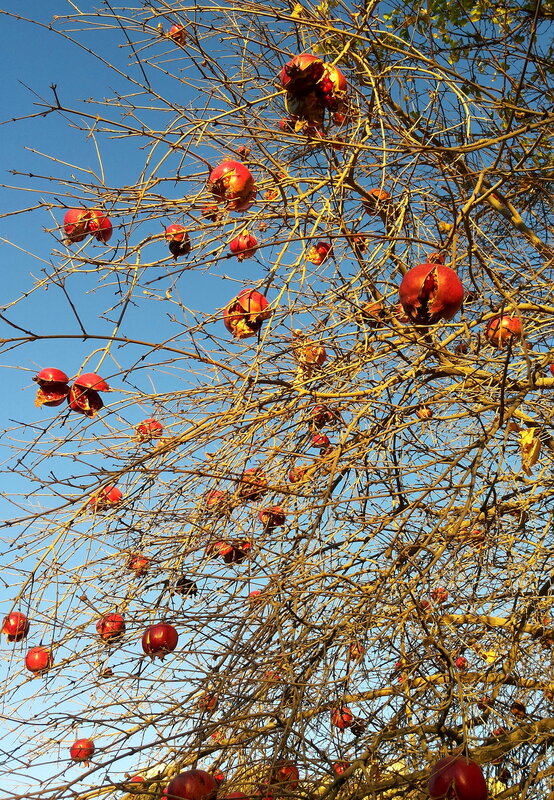 The ripe fruit hanging from the bare branches like baubles in hues of red, crimson and magenta. The little jewels in the split fruit glistening in the sun like crystals. It is natures own Christmas tree. My beloved DSLR camera died a couple of months ago never to go again so I’ve been having to make do with the camera on my phone. Oh how I miss my DSLR and the greater degree of control and quality that it gives you when taking photos. Anyway here are the photos of the tree which I hope you enjoy. So lucky to have all those pomegranates around! It is definitely one of the things that I love about living in the Middle East is having access to fresh fruit such as pomegranates – and they are so cheap. 10kgs for less than a couple of dollars. Absolutely lovely photos proving one does not always need a complex camera to do justice to one’s environment. 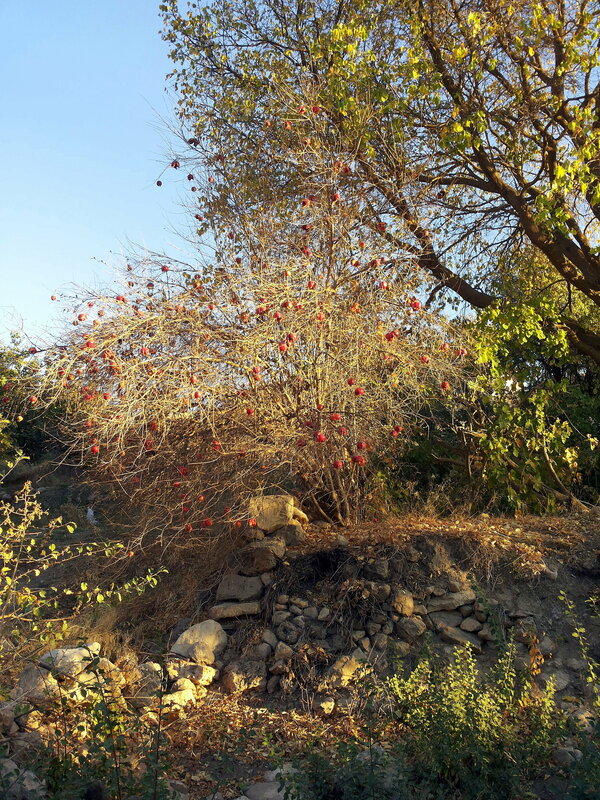 I am presuming these are actually wild pomegranate trees and not belonging in someone’s orchard? The trees are growing in a valley that is technically part of someone’s orchard but is no longer tended to so the trees are just left to do their own thing. I love spending time in this little valley. Thanks Suzanne. This tree in particular always catches my attention with it’s bare branches contrasting against the plump fruits. We always buy up a few boxes of pomegranates at the end of their season and store them in a cool dark place so that we can enjoy them well into winter. They store really well for about 4 months provided that their skin isn’t bruised or damaged. Sad to see all that gorgeous fruit going to waste. 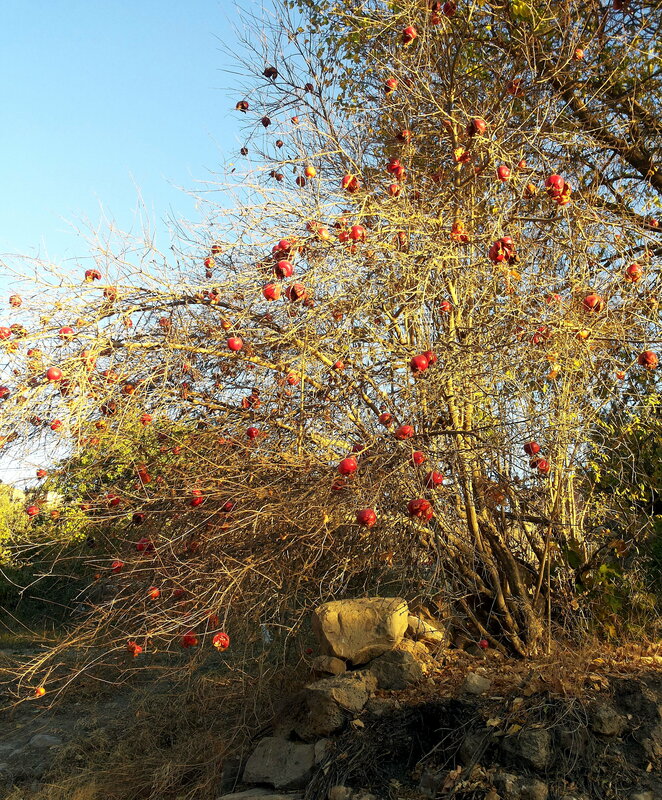 I love driving around Salt this time of year to see the pomegranates. Thanks for sharing! 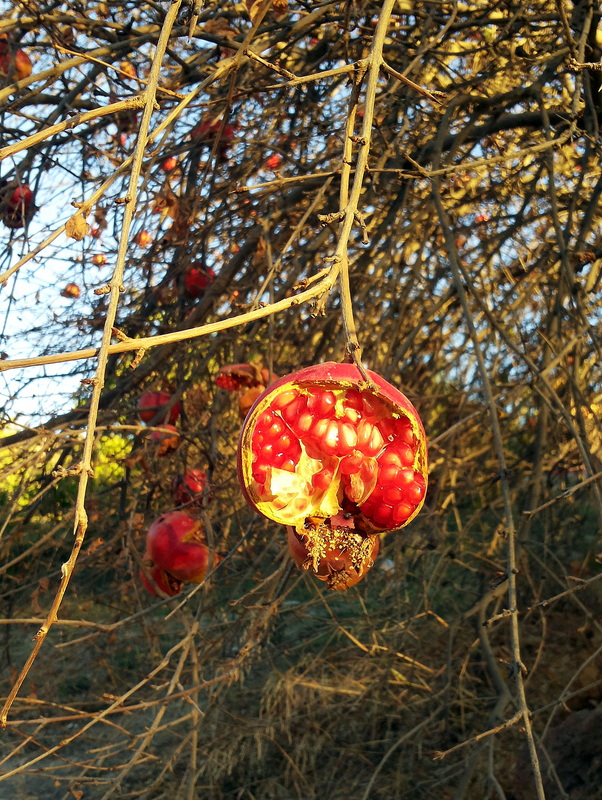 These are the sour pomegranates – not great for eating as they are really tart. I had thought that they might be good for making pomegranate molasses out of them. Can you believe it Jim but I’ve never been to Salt in the 3 1/2 years that I’ve lived here. Sounds like a destination that I need to put on my list of things to see in Jordan! Such gorgeous pictures! Your country is beautiful! Thanks Aurum. Jordan is indeed a beautiful place and full of the unexpected. Come and visit one day. Fab pics. I’m leaving Riyadh this minute, heading to the airport and getting ticket to Wadi Musa! I so enjoyed these pictures! I have a thing for pomegranates, too. Just yesterday I stood and admired the way the sun was illuminating the yellowing leaves of ours–those on the tree and those which had fallen into the dirt below. 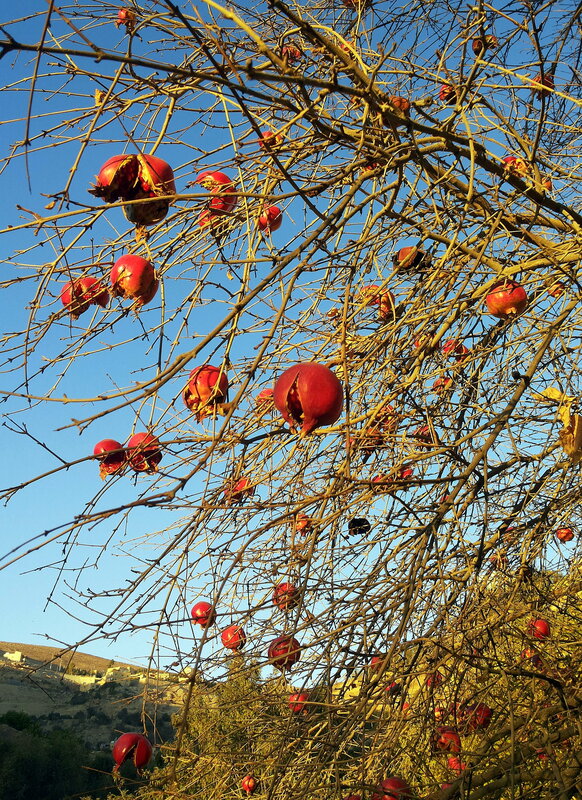 Our tree has only one dried up pomegranate left on it. The tree you are admiring is beautiful! 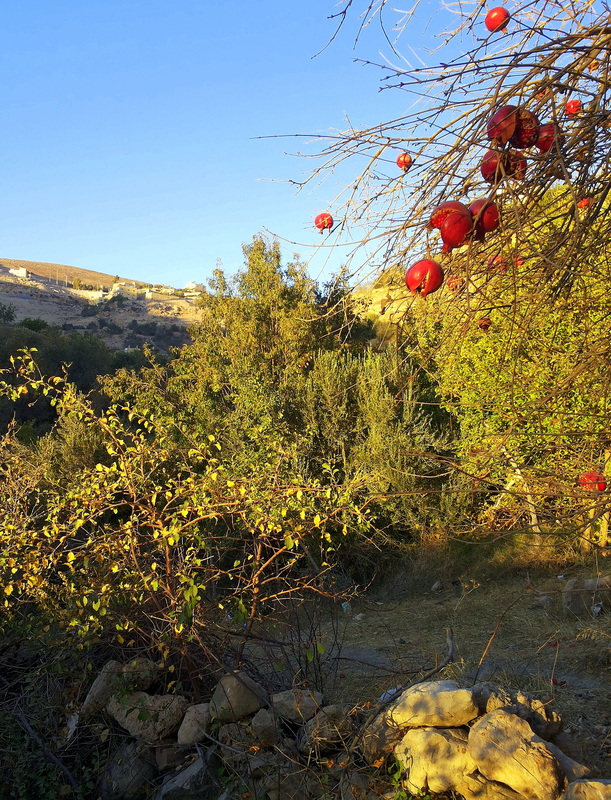 We were in Turkey a couple of weeks ago and drove past orchards and orchards of pomegranate trees. I think pomegranate red must be one of my very favorite colors. Thanks Melissa. Pomegranates are really beautiful from the fruit to the leaves to the structure of the trees – everything about them is magical. I haven’t had the opportunity to visit Turkey as yet. Seeing whole orchards of the trees would have been so beautiful. I would have to agree that pomegranate red is probably one of my favourite colours as well. I think pomegranates are one of my favorite fruits. In the states I’ve seen the trees they hang on but the pictures you posted make them look very different. Here in Kazan they are all over the marketplace and even while in Israel I saw many of them. Thank you for this post, very informative and like the way you weave a story. 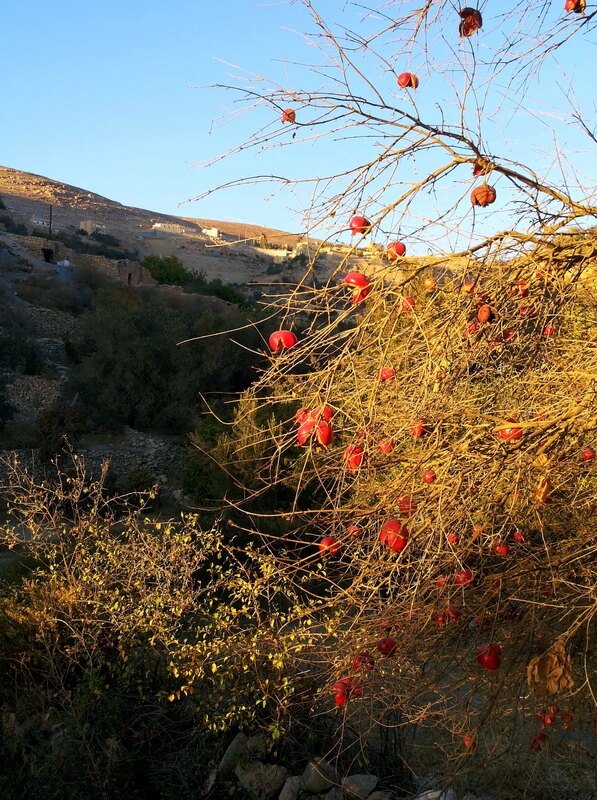 The pomegranate trees are so decorative…just lovely. Full of treasures hanging on the branches. Looking for a particular Moment? How not to throw a 1st birthday party.